Aberdeen have signed defender Donervon Daniels on loan from West Bromwich Albion for the remainder of the season. The 21-year-old goes straight into the squad for Saturday's League Cup semi-final against Dundee United, subject to clearance. Daniels has yet to feature for the Baggies but has had loan spells at Tranmere, Gillingham and Blackpool. 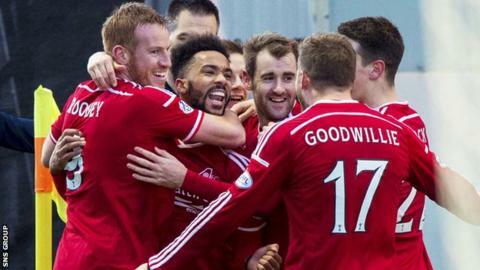 "We've got a player with a good presence and for who we have a high regard," said manager Derek McInnes. "I would like to express our thanks to West Brom for their assistance in getting the deal completed. "Hopefully his time with us with be beneficial for both us and Donervon." Daniels played in 19 games for Blackpool this season, making his final appearance on Boxing Day.